I’m guessing this should be pretty easy but I havent looked at html for many years. I need to get finger data from a web page on a mobile phone into vvvv so I can draw it. Server a page from vvvv I get, but how do you stream finger data for example, bonus points for multiple users! I’m sorry, pretend your explaining bitcoin to your dad…! I added the code you posted between some tags in an index.html, but I’m not sure how to connect the vvvv node to it, what does the input to the node take? This newfangled web thing will never catch on! You should see a client connection at the clients pin of the WS node. 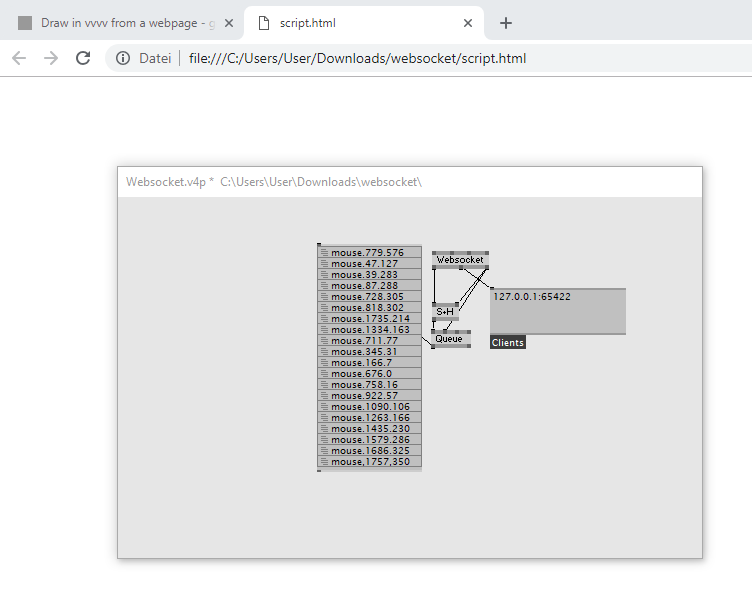 If you connect an s+h to the output you should also catch a “Hello Server” string that is send on opening the websocket. Pay attention to the port in the java script so it matches the one you set in the patch (81 should be fine). Also i assume you are testing on local machine so the adress is localhost. Also make sure windows firewall is allowing all this. So here is a super reduced html file that i just tested. It does send mouse and touch coordinates to a websocket server on localhost port 81. Also add a mainloop to your patch to keep up with your browsers 60fps, the ws node is queueing. I have a websocket, which presumably hooks into the browser in some manner (lets call it magic) I open the script.html? and it magically works? Do I not need to host this page so it can be accessed? F12 and pasting the code into the console doesnt seem to do anything. I feel like I’m missing something fundemental here! I will of course get some to make a webpage for me, but I need to understand how the interface works/workflow of getting it running. I’ve tried hosting the script.html with an http node, and that doesn’t seem to work either, sorry to seem so dense, but this is why I last looked at html in 2003, seems unduely complicated! Also can it run on any webserver local to the vvvv patch, can it be run on one remote to the patch? You can host the html however you like, even just open it from disk. Did you grant vvvv the right for inbound and outbound traffic in the windows firewall? Maybe just disable the windows firewall for testing. What you sent in the zip works rightaway. Just open the html in a browser. Regarding the patch, you connected on data to the queue reset, but anyway you should see a connection on the client pin. Well that was odd, just retried and it all works! thank you!